Here's another finished product that was started more than a year ago. My goal was to wrap this up this last weekend, but a reality check right before seaming the shoulders made me realize I needed to rip the front out completely. One of the consequences of taking a long break is being punished by your gauge. I almost talked myself into living with a front that was almost two inches wider than the back, but an early morning session with the winder felt really good. My lazy knitter didn't win this time. I have a feeling this sweater will be a favorite along the lines of my Central Park Hoodie. 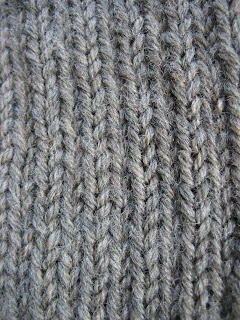 It doesn't try to be clever or trendy, just a simple classic design, fairly good fit and the warmest yarn ever. Next up, a sweet penguin sweater for Isabel. 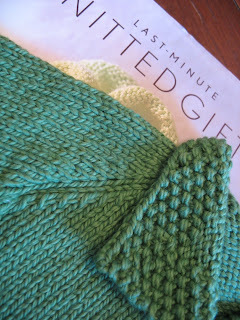 I dove into my large Cotton Ease stash for this special request project. I'm already done with the back and one sleeve. Hopefully, her penguin obsession will last long enough for me to finish the sweater! When we simplify life, we must prioritize. Instead of reading dozens of blogs, paring down to a few cherished gems. Those that bring me wonderful patterns, knit-friends, or deep soulful inspiration. My knitting lately has become less of a production and more of a meditation. Watching the loops on the sticks stack one on top of another until they take shape and form. Projects are chosen more mindfully. Less multi-tasking, more monogamy. Slower. Less. More soul. Less obligation. More joy. Time is spent deepening enjoyment in each activity. The knitting can stop and wait for food, family, and friendship. So I will choose carefully. I will try to re-engage with my Ravelry, update my page with my recent small, wonderful projects. And I will knit as if I had 100 years left to live as well as if I had only one day. Tomorrow we head up to Washington, DC, to celebrate. To bask in the collective, joyful energy of millions of our neighbors and friends. Please take some time to spread some kindness, serve your community, slow your life down, or deepen your experience on this earth. I've really been enjoying the 2008 retrospectives around blogland lately: the flickr mosaics, the wrap-up posts, the resolution posts. 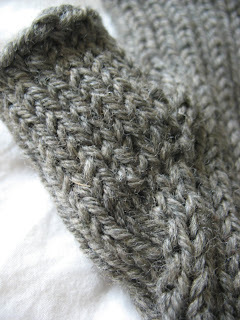 Since knitblogging has become mostly an endless parade of FO posts (she says, squarely pointing the finger at herself), it was refreshing to see some reflection, some thoughts about the process of knitting and the reasons why we knit. I, however, am not doing a 2008 retrospective, mainly because I realized that those wonderful flickr mosaics can include only 36 pictures, and I KNIT 48 THINGS in 2008. 48. And there are a few things that just never got photographed because although the simple hat or socks are a pleasure to knit, they're certainly not worth a blog post, and hardly worth the energy to take a decent photograph. So I think I actually knitted about 50 things this year, which averages to about one FO a week. That is a lot of knitting. This number really disturbed me, which is strange, considering that in 2007, I knit about the same, and at the time I was really psyched. I like knitting a lot, and relished having the time to make lots of wonderful things. I really take pleasure from knitting, and pursuing pleasure is a good way to spend your life. Knitting challenges me, and allows me to be creative. All that knitting also helped to rationalize the size of my stash, because if you are going to knit a lot of things, then, well, you need a lot a yarn, right? The yarn gets knit, the patterns get made, and I was all set to just knit knit knit my life away. But this year, the number hit me right between the eyes. I'm in a very reflective place right now. My life is changing. My kids are in school and they require less of me on a daily basis. As a result, I've been experiencing classic Bored Suburban Housewife Wasting Her Life angst. This is combined with my ongoing crisis of dissatisfaction with other elements of my life since moving from Virginia to Pennsylvania. Despite the move having been very beneficial to my husband and his career situation, and despite the fact that I now live in a culturally rich, wonderful place and in very close proximity to my wonderfully supportive and fun family, I have yet to find MY niche. I have yet to feel at home here. But I'm in my late 30s. I am a grown-up and in charge of my life. I get this. If I don't like things about my life, it is absolutely within my power to change many of them. 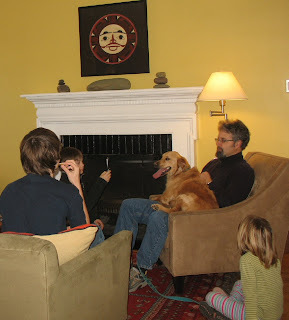 My days at home with young children are ending, so it is up to me to write the next act of my life. If I don't like things about where I live, dammit, I can move. If I fear I have become boring, then it is up to me to enrich my life. It is up to me to nurture the social connections and friends I do have. I need to be open to life and to make the one life I have the one that I desire. I can do better. And honestly, I realized that knitting all those FOs is an obstacle to that, for me. That number, which before seemed so desirable, made me understand that knitting for me has been a crutch. It has been a way for me to rationalize being lazy about my own life. There are things in life I want to do besides knitting, but knitting was dominating it all, replacing it all. I wasn't reading as much. I wasn't moving as much. I wasn't tackling home projects or working on things that I wanted to, because I just couldn't wait to get in that knitting chair and pick up those needles. I'm generally an undisciplined, lazy sort of person, and knitting is the perfect way to avoid writing that novel, visiting that museum, cleaning ones closests or calling a contractor to renovate your master bathroom or anything else productive. I certainly think that knitting is a worthy way of spending ones time. I acknowledge that for so many knitters, all that time to knit unencumbered by work or other responsibilities would be like a gift from the gods, and I am grateful that I have a life that gives me time to do it. But all that knitting, while I really, truly enjoyed it, every minute of it, wasn't helping me figure out what was going to make me happy. It was keeping me on the couch, in the house, in front of the TV. Zoned out. Tuned out. And with one hell of a messy master bath desperately in need of renovation. I see other knitters who have made knitting Their Next Act, knitters who write books or start businesses or teach classes, and perhaps knitting will show me the way. Or maybe something else will. Maybe a job or a calling or a new neighborhood or a new community will open itself to me, and I can give of myself in a new way. I plan on writing more, but wasting less time on the internets this year. I plan on moving more, and seeking out a more dynamic life for me and my family. I plan on taking more advantage of my Philadelphia home. I plan on learning and reading and taking chances here and there. I plan on saying yes to more things I enjoy and saying no to the things that bring me down. So yes, I enjoy knitting and take great pleasure in yarn and making things with it, but this year, while I will still knit and create and write and blog, I've resolved to knit less. Aren't we lucky that our knitting always takes us back? Just like a good friend -- so forgiving and welcoming. I guess that's one reason I'll probably always knit, even if I take long, unexplained breaks. Yes, Dinah is done! 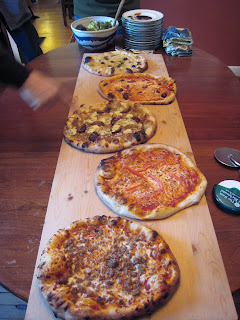 This was a "quickie" project that started in November 2007. I planned to wear it to my office holiday party, but when I missed the date it lingered (well, more than lingered). Last week, I dug it out and found that I only had 3 cm left on one sleeve! I finished it up, and I'm fairly happy with the results. 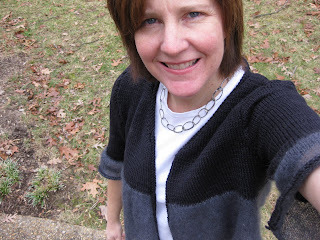 This sweater is so light weight you don't know that it is on, but it keeps you amazingly warm. Mods: Shortened the KSH part of the sleeves; plus, knit the silk wool part first and then knit the KSH into the wool instead knitting them separately and joining. Next up, another lingering WIP-- Carrie from Ella Rae in Noro Kureyon. Just one sleeve to knit and I'll have another long forgotten project completed. I must complete this one while it is still cold, or it may never see the light of day. Plus, Isabel has made a special request that I just can't refuse. I'll wait to tell you about it next time.